After attending two years of junior college, Father Albert received a scholarship to play football for the University of San Diego, which was then the location of the diocesan seminary. There he met two young seminarians who led him to discover the Carmelites. Ultimately, Father Albert was the only one to pursue a vocation to the priesthood, but the three remained lifelong friends. “God used them to help me in my discernment,” says Father Albert. He entered the Carmelite novitiate in September 1958, professed first vows the following year, and took solemn vows on September 8, 1962. His years of ministry had him zig-zagging between California and Arizona. He served not only in various parishes but also in formation and retreat ministry. 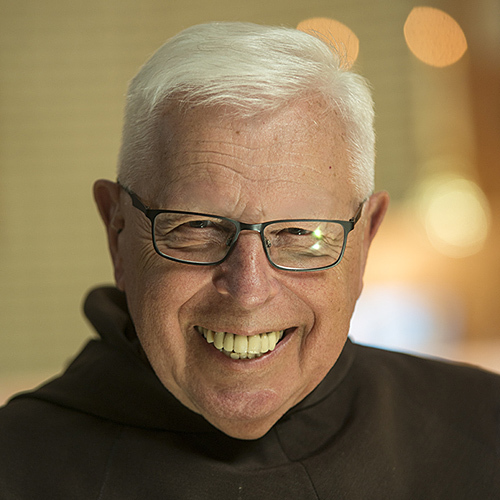 For six years, he was superior of his community’s house of prayer in Oakville, California, followed by three years as the superior of the novitiate in San Jose, California. Since 2013, he has been at St. Therese Church, a parish founded by his religious order in 1924. Although technically “retired,” Father Albert continues to serve. “I can’t do everything,” he says “but I am able to contribute by hearing confessions, anointing the sick, and celebrating Mass. I’m happy to do those things.